Port Stephens is the next waterway north of Newcastle, New South Wales. It was named by Lieutenant James Cook, RN, in 1770 as he passed by on his historic voyage of discovery. Nelson Bay is the main town of Port Stephens and is a major tourist attraction. Tourists from all over the World come here to see the wild dolphins that live in the waterway and which can almost certainly be seen on every cruise. The dive starts at the bottom right and heads to the end of the wharf in centre. One of the reasons that the dolphins are so common here is that the waters are normally so pristine and the fishlife prolific. As divers, this is something that makes this a major attraction. 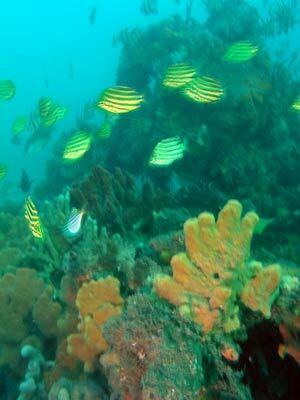 Nelson Bay is one of my favourite dive locations in New South Wales and the best sites are all shore dives. 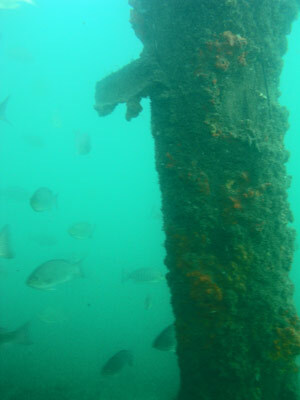 You can do five or six different dives in this area, including Halifax Park, Fly Point and the Sewage Pipe. Nearly all the dives here are dependent on the tides (best done at high tide and only able to be down at high or low tides). One of these is Little Beach. To find this spot, head towards either Fly Point or Halifax Park. If you go to Fly Point, keep going along Victoria Parade (the street that Fly Point is in) till you almost reach the end. Park in the car park on your left (or right if it is full). This is at the intersection of Victoria Parade, Beach Road and Dixon Drive. If you are driving towards Halifax Park, turn left at Victoria Parade (the road just before the beach and boat ramp) and park on the right (or left if full). You are parking in the area jsut outside the cafe's parking area. Once geared up, walk towards the small wharf to your right as you look at the water. There is a worn track down to the beach just before the wharf structure. Take this and walk into the water before putting on your mask and fins. Be careful as there are many rocks on the bottom. Once you have descended, head just west of north and you will pass by the end of the wharf that comes out from the cafe. This is a spot that has some amazing fishlife. 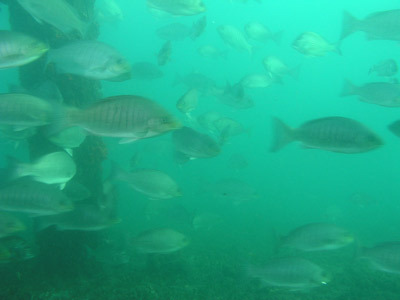 Under the wharf there are literally hundreds of luderick and large numbers of bream. It is worth hanging around here for a few minutes just to experience the fishlife. To the north of the wharf there are lots of bits of old wharves, pieces of wharf decking and whole pylons. In this area there are also sea horses. These are White's sea horses and the ones that I have seen when diving here are quite small, about 25 to 30 mm long. Look carefully on the sponges. The depth under here is about 8 metres. From here, head roughly west and you will see some more wharf bits. On you left you will notice that the bottom slopes down and if you follow the flatter bottom you will be heading in the right direction. As you go you will see that the bottom is sand with some spots that have sponges, small gorgonias and other marine life. 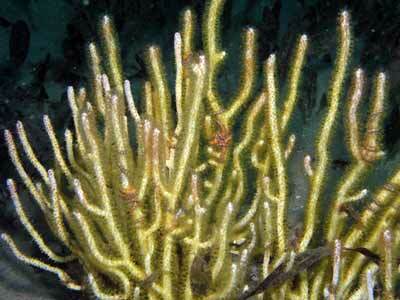 These have a lot of life on them, including nudibranchs, fish and sometimes sea horses. The depth will stay the same for about five or so minutes before gradually dropping to 12 metres. In this area ytou will see a large object totally covered in growth. This is the remains of an A-frame that sunk here (you will see one on the water before you enter). A sbort distance to the south-west there is a large pontoon. This is about three metres wide and 15 metres long. 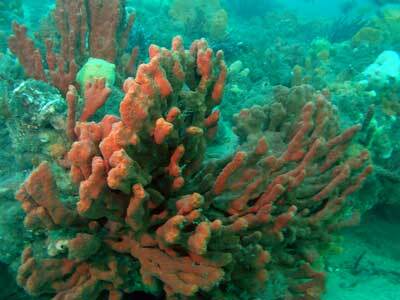 Like the A-frame, it is totally covered in growth, mostly sponges. There is also quite good fishlife in this area. look for bream, yellowtail, blue groper and more. Once you leave this spot, head back towards the east, roughly running parallel to your route out to here. 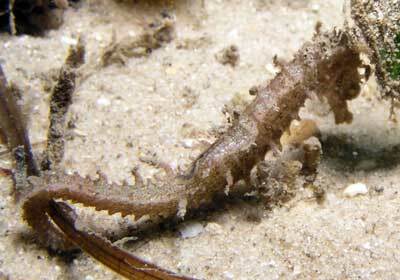 Look for more sea horses and also pipefish. When you are back near the wharf, head out towards the north. The bottom is similar to that encountered previously. After a short distance you may see a mooring and then a piece of rope that seems to run from left to right. Go a bit past this and you will see that the bottom goes to a mostly sand bottom. Head right here and you will soon encounter what appears to be a barge. Dave Harasti from Fisheries who showed me this site says that it is the remains of a houseboat. You will see that it is about 5 metres wide and perhaps 15 metres long. The section to the east is now almost totally under the sand. Apparently it has changed a lot in the past year or so before I first dived here in 2007. There are a lot of fish in this area, yellowtail, seapike and more. From here head to the south and you will end up back near where you started. Exit back onto the beach. This is a very nice dive. I had about 20 metre visibility here on a small high tide. This would also make a very good night dive.